Ginger, the root of the Zingiber officinale plant, originated in Asia and has been used as a spice and herbal medicine for thousands of years. 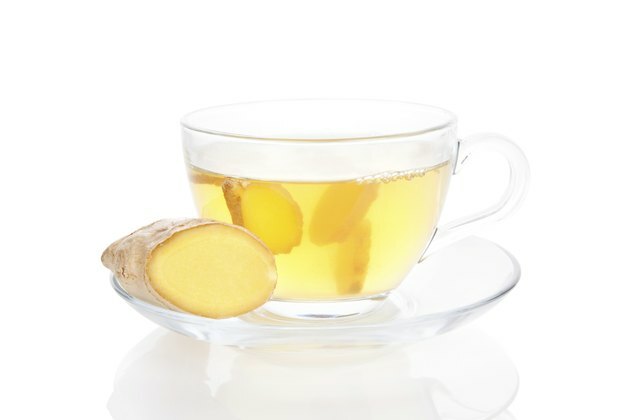 Ginger water, or ginger tea, is made by boiling fresh ginger root in water, then cooling and straining the liquid. Although it's most often considered a treatment for digestive discomfort, ginger may hold the key to numerous health benefits. Throughout history, ginger has been widely used to relieve nausea. It's commonly used to prevent seasickness. It has been used as a treatment for nausea and vomiting associated with a variety of conditions, including chemotherapy and pregnancy. A study published in "Support Care Cancer" in July 2012 noted that daily ginger supplementation significantly reduced severe chemotherapy-induced nausea in cancer patients. Drinking ginger water may help to decrease inflammation, joint swelling and pain experienced in conditions such as osteoarthritis and rheumatism. An article published in "Journal of Medicinal Food" in the 2005 summer issue noted that during the past 25 years scientists have provided scientific support for the long-held belief that ginger contains powerful anti-inflammatory properties. Ginger is a source of antioxidants. Antioxidants are powerful substances that protect your body against free radicals, which are unstable molecules that may cause damage to healthy cells. An article published in "Journal of Agricultural and Food Chemistry" in July 2010 noted that the results of a study done on the composition and antioxidant power of ginger revealed that fresh and dried ginger contain powerful antioxidants. The results suggested that ginger can be used as source of natural antioxidants in foods. Ginger water may be effective in helping to prevent and inhibit cancer growth. The mechanisms responsible are substances in ginger, including antioxidants, which have been shown to kill and decrease the spread of cancer-causing substances in the body. An article published in the "British Journal of Nutrition" in February 2012 noted ginger has anti-inflammatory and antioxidant properties and has been observed to slow the spread of certain cancers, indicating that ginger may play a promising role in the prevention of cancer.